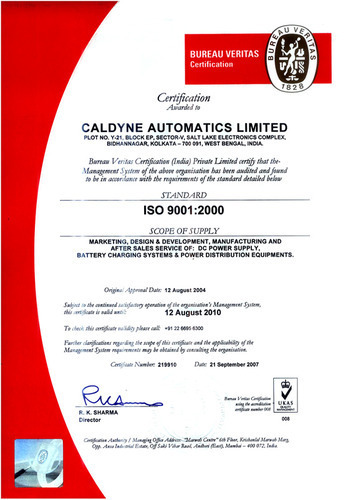 Chloride Power Systems and Solutions Ltd. (formerly Caldyne Automatics Ltd.), Indias No.1 Industrial Battery Charger Manufacturing Company, and a reliable DC Power Solution partner.Chloride Power Systems and Solutions Ltd. (formerly Caldyne Automatics Ltd.) provides excellent power continuity and clean power through its total DC Power Solutions. CPSSL brings a wide range of world class power electronics equipments, addressing the DC power supply needs, conforming to national standards. CPSSL is powered by an all new-technology which represents years of advancement towards the goal of positioning the company as the Market Leader and be the single largest source for a wide range of DC Power solutions. We are a wholly owned Subsidiary of global Lead Acid Battery major EXIDE INDUSTRIES LIMITEDand in the DC Power Management arena with a sales and service network all over India. Ever since its advent in 1980 CPSSL (Currently) focus has always been excellence in quality of products and dedication in service. This has facilitated CPSSL (Currently) to carve a niche for itself in the Indian Industrial Battery Charger market and has made the brand CALDYNE a legend in the country. In 1999 EXIDE took over 51% stakes in CALDYNE and in July 2007 EXIDE acquired entire share holding of CALDYNE. Please refer www.exideindustries.com. Fron 1st june 2011, the name Caldyne Automatics Ltd. changed to Chloride Power Systems and Solutions Ltd.
Our team of highly qualified professionals is instrumental in achieving a global leadership based on an integrated value chain and competence in all relevant business processes.